FOXBOROUGH, Mass. (AP) — The Miami Dolphins‘ undefeated start to the season came with some early excitement heading into their matchup at New England. That buzz went flat again — in a familiar place — following Miami’s lopsided 38-7 loss to their AFC East rivals . The Dolphins (3-1) were looking to improve to 4- 0 for the first time since 1995 — Hall of Fame coach Don Shula’s final season. Instead, they were humbled in every phase during Sunday’s dizzying setback. Ryan Tannehill had been a steadying presence for the Dolphins’ offense during the first three weeks of the season, completing 73 percent of his passes for seven touchdowns with just two interceptions, improving to 10-1 over 11 starts in that span. But he regressed against the Patriots (2-2), looking every bit like the quarterback that is now 0-6 in games at Foxborough. Tannehill finished 11 for 20 for 100 yards and an interception. He was pulled in the fourth quarter in favor of Brock Osweiler. Osweiler connected with Frank Gore for a 6-yard touchdown pass in the fourth quarter for Miami’s lone score. In his six losses at New England, he has just 837 passing yards, four TDs and two INTs. With Tannehill ineffective, the offense struggled to make first downs. It went 3 for 11 on third down while managing just 172 yards. Miami also relapsed to a team prone to self-inflicted wounds, amassing 10 penalties for 89 yards. Last season the Dolphins’ offense led the league in penalties (65) and penalty yards (553). As bad as it looked, running back Kenyan Drake said it was just a shot to the system and not something they can’t bounce back from. If there was one positive takeaway from Sunday’s loss, it might have come on the defensive side of the ball. The Dolphins managed to pick off quarterback Tom Brady twice. Cornerback Bobby McCain snared one on Brady’s deep, third down pass over the middle in the first quarter. It was Brady’s third interception of the season. He didn’t throw his third interception last season until Week 11 against Miami. Minkah Fitzpatrick got the other in the fourth quarter . It marked the Miami defense’s ninth interception this season. It had nine all last season. It’s why Miami linebacker Kiko Alonso said there is still plenty to be excited about in their locker room going forward. 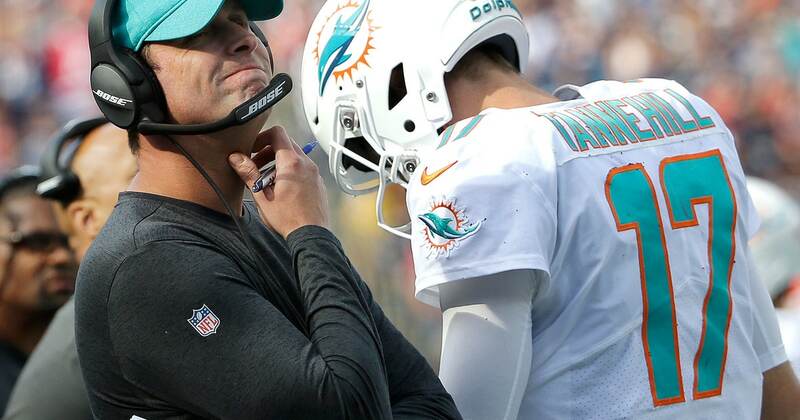 The Dolphins entered the day having won all three of their games this season by one score or less — amassing a record of 16-5 under coach Adam Gase. They are 3-13 in games decided by more than one score. Miami was already down a safety with Reshad Jones sitting out Sunday’s game with a shoulder injury. Add cornerback Bobby McCain to the list of players on the mend after he left the loss with a knee injury. Dolphins center Daniel Kilgore also left the game in the first half with an arm injury. Gase didn’t have an update on the severity of McCain’s ailment. “Obviously him not coming back into the game wasn’t a really great sign,” Gase said.